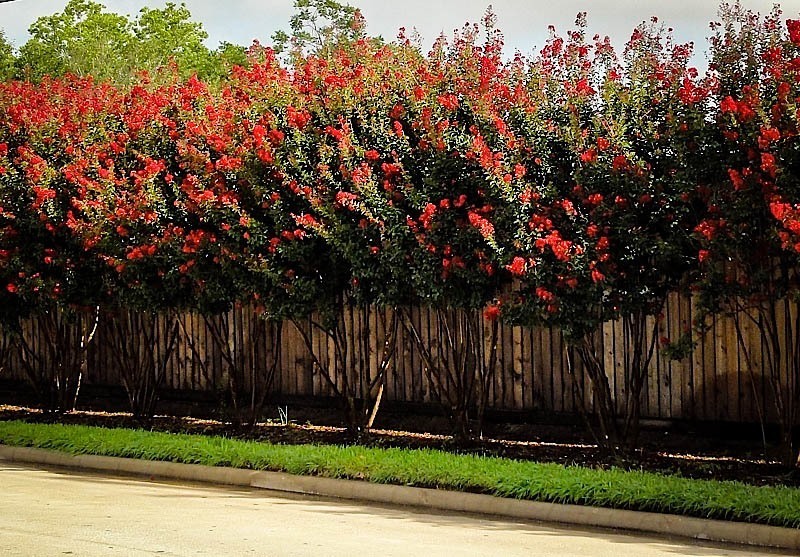 Bright Red Blooms – Red Rocket Crape Myrtle is the queen of crape myrtles, with its brilliant red flowers produced all summer long. As its name suggests it grows like a rocket, shooting up as much as 5 feet a year, to quickly form a beautiful screen or specimen in your garden. It loves full sun, is drought-resistant, will thrive in most soils and needs little or no pruning. It can be planted as a gorgeous individual specimen in a smaller garden, among other flowering shrubs or as a spectacular screen for privacy. For drought tolerance and the ability to grow in poor, compacted soil, this tree takes some beating. At 15 feet tall it is the perfect size for every garden – as a lawn specimen in a small one or a background shrub in a large one. It also makes a great screen a couple of stories high in narrower urban spaces. 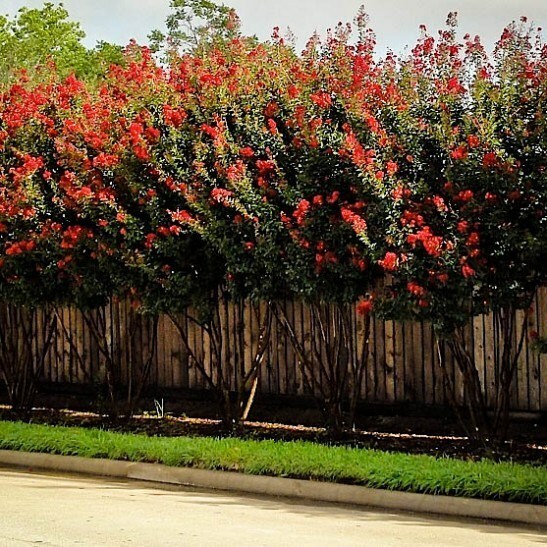 If you live in the warmer parts of America there are many colorful trees and shrubs that you can grow – but Red Rocket Crape Myrtle is one of the best. Not only does it have beautiful vivid red blooms all summer long, but it also grows rapidly into a full-sized shrub or screen. 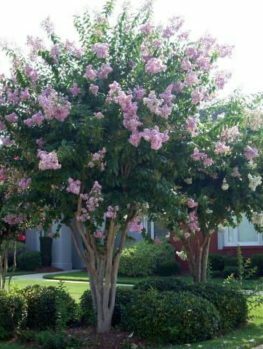 Crape Myrtles come in many sizes, so the wrong choice may leave you with a baby plant where you wanted a full-sized tree. 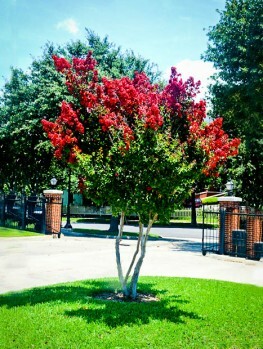 Red Rocket is a full, tree-sized Crape Myrtle, quickly passing 12 feet in height. 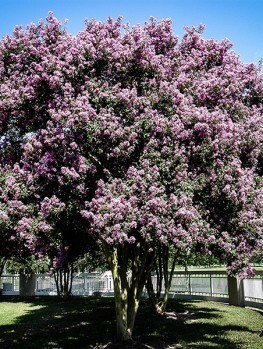 It is perhaps the fastest-growing Crape Myrtle you can buy; but you don’t have to give up beauty for speed, because this tree is a real beauty. It will grow 5 feet each year, so it quickly develops into a dense, beautiful flowering screen in just 2 or 3 years. It is drought tolerant and any pests it gets are minor so they will give you no problems. It is also deer resistant, so it can be planted virtually anywhere. In humid states it may develop a little mildew on the leaves, but this is harmless and will disappear over winter so your plants will come back fresh and green in the spring. This is such an easy plant to grow that if you allow enough space it won’t even need to be pruned, but will produce a profusion of stunning red flowers all summer long, year after year. 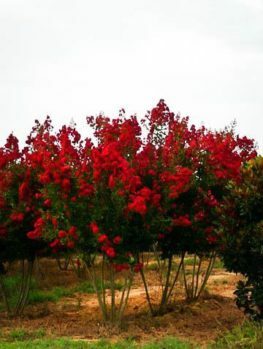 Red Rocket Crape Myrtle quickly grows into an upright small tree or large shrub 12 to 15 feet tall, with glossy leaves and enormous clusters of beautiful red flowers produced all summer. The bark is an attractive light-brown and naturally peels off to reveal fresh new bark below. The leaves turn a lovely yellow in the fall and the twigs are attractive all winter. 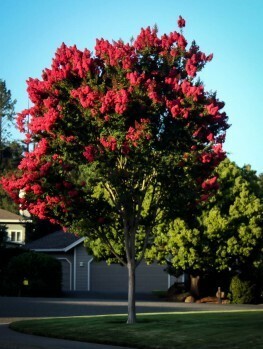 Red Rocket Crape Myrtle grows in zones 7, 8 and 9, from Virginia throughout the South, and from Texas across to California and right up the west coast. It needs full sun and does well in all kinds of soil except those that are often wet, where it will not grow well. So don’t over-water or plant in a low-lying, wet spot. We have lots of other choices of plants for those locations. 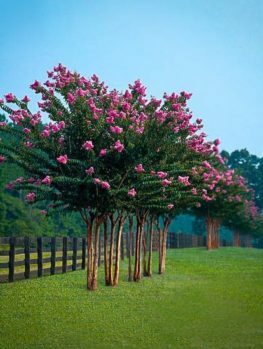 Red Rocket is more upright than many crape myrtles, so when planting a screen they should be planted 4 feet apart. 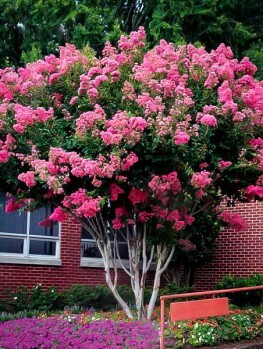 It is important when planting crepe myrtles not to plant any deeper than the containers they are in and not to cover the roots with a lot of soil. So dig a hole or a trench two or three times wider than the pot, but no deeper. Place your plants in the hole, replace most of the soil and firm it well down. Then water thoroughly and replace the rest of the soil, being careful not to cover the roots with any extra soil. 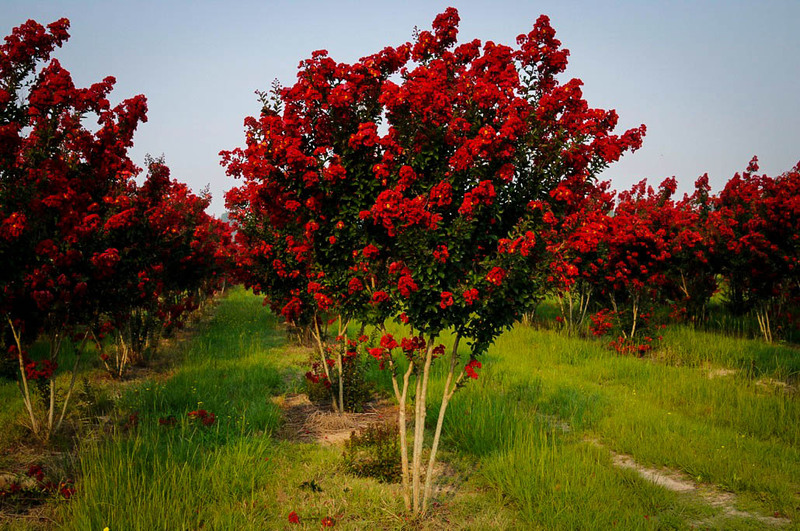 Red Rocket Crape Myrtle needs full sun, both for the health of the plant and so the flowers will develop their proper red color. It will take just a little shade, but the more shade the fewer flowers. Once established it is very drought-hardy and rarely needs water, so this is an easy tree to care for – in fact it cares for itself. If you want the maximum growth this tree is capable of, then water regularly and give fertilizer regularly, but this is not needed for mature plants. They need no special pruning, but they can be shaped during the winter. Prune while young, since it is best not to cut branches thicker than 3 inches across, and if plants are cut hard they will produce lots of growth but fewer flowers. If you have a specimen tree you might want to remove old flowers to encourage more new ones, but Red Rocket will continue to bloom even if you do nothing at all. This is truly a low-maintenance plant. The common Crape Myrtle (Lagerstroemia indica) was first brought to Charleston, South Carolina around 1790 from its natural home in China and Korea. It thrived in the warm climate there and has long been a symbol of summer in the South, with its vivid blooms. From those original plants many forms have been bred, but Red Rocket is without a doubt one of the best, combining strong color with rapid growth and sturdy form. 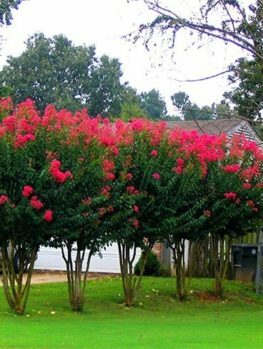 The original crape myrtles were white, lavender or pink and it took until 1997 for Dr Carl Whitcomb, a famous professor, to produce the first and then others, of which Red Rocket is considered his best and certainly the most popular. Red Rocket is such a special plant that only the exact plant will have the right color and growth rate. It must be produced directly from trees absolutely known to be right. Our trees are grown the correct way, from branch cuttings of these special trees. That way every tree is identical to the original so they will produce a very uniform effect when planted in a row. However, these take longer to produce so avoid cheaper, seedling trees that will only be a disappointment. Crape Myrtles labelled ‘Red’ will definitely not be this famous Red Rocket.